We purchased Donner-Versace (Archie) 12 months ago and without Victoria’s expert help and care he wouldn’t be as fit and healthy as he is now 12 months on. Archie had been in semi retirement for 2 years prior to coming to us, and is a rising 15 years young, advanced trained dressage horse. 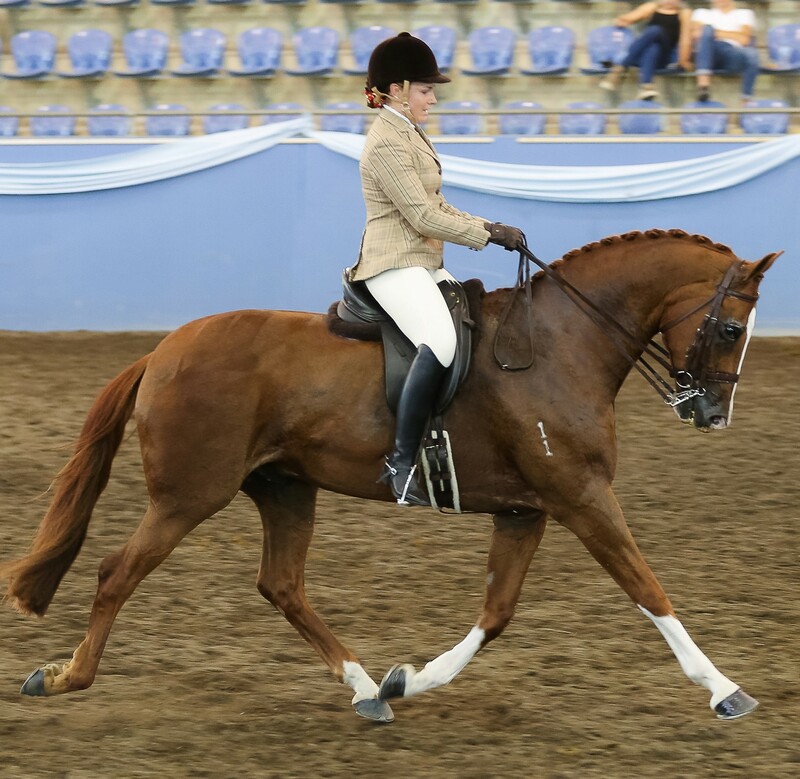 He is a warmblood chestnut gelding with the typical chestnut personality, lots of monsters in this world! The move was a shock to his system as he had been in his previous home for 7 years and was very set in his ways. Archie went lame two weeks into living with us and was diagnosed with stress laminitis. My quick thinking got me straight onto the phone to Victoria, and Archie up to the hoof specialist vet Jen Lugton at Hawkesbury Equine the very next day. Victoria you were amazing and so quick to help and provide a diet and herbal treatment program for Archie that hasn’t missed a beat. He needed to lose weight as well as get his gut and hooves healthy. Jen put him into rubber orthotic boots for the first 6 weeks then into rocker orthotic shoes for 6 weeks after the boots, and a whole new hoof capsule has grown. His feet have never looked better!! I put this down to his VF Natural Diet and herbal prescriptions, and his special shoeing. He is shod every 5 weeks under x ray by Jen and my farrier, and the growth and improved structure of his feet during the last year has been remarkable. Jen has been so impressed with his natural diet she has recommended her patients to me for my story and in turn I have passed on your details to them. We were riding Archie 2 months after he went sore and spent the summer getting him fit. He is looking and working beautifully. Ashlee showed him at Pacific Coast Hack Championships in February for a Top 10 place out of a huge class of 24 Small Hunter Hacks, then onto Canberra Royal for a 6th place in the Novice Hunter hack 15.2-16 in a huge class of 22, then onto NSW EA HOTY where he was awarded 3rd place and Reserve team member for EA Nationals in December. He is a happy boy and I can’t thank you enough Victoria!! Ashlee has recently been in Germany training with Hayley Beresford for 3 months and she plans to campaign Archie in FEI dressage next year. Thank you, Lisa, for this wonderful story! My practice in healing laminitis, is to treat the cause as well as the symptoms. There are quite a few different causes – toxicity, stress, metabolic and just plain overweight. In Archie’s case, it was a combination of metabolic and stress. So he needed a liquid herbal extract prescription for oral dosing twice daily before feeding, to work in tandem with his natural diet, to heal the laminitis, to improve his hooves, to ensure he had sufficient energy to perform, to develop good muscles and to keep his weight at the right level so he never has laminitis again. I chose herbs to balance his metabolism, to provide liver and gut detoxification, and to stimulate the circulation to the hooves to improve the growth rate. Of course everyone always wants to know what herbs I use but I steadfastly refuse to reveal them, and for very good reasons. Number one, I use human medicinal quality liquid herbal extracts which are only available to practitioners, and because they are oral dosed liquids, they are absorbed into the bloodstream very rapidly, therefore dried herbs will not work satisfactorily. Secondly, the proportions of different herbs in the mixture differ considerably. Thirdly, the herbs that are right for one horse with laminitis, are not right for another horse with laminitis, as mentioned previously. Fourthly, the herbs in the mixture need to be changed as the horse progresses. For example in the early stages, pain relief plays an important role while in the latter stages, herbs to stimulate hoof growth are called for. Finally as rapid diet changes are not best practice, suddenly dumping a whole lot of dried herbs into a feed is not the way to go, and it is highly unlikely the horse would eat them anyway. However, horses just adore the aroma of the liquid herbs and virtually every client tells me how their horses open their mouths for their syringed herbs and don’t even need a halter to be dosed.